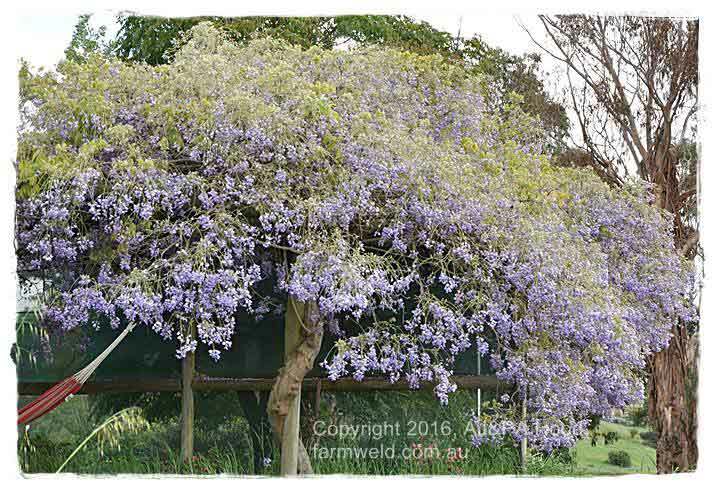 Farmweld > Blog > News > I want to buy a Wisteria arch! We get frequent enquiries about wisteria supports, with many people wanting to grow wisteria over smaller arches. The beauty of wisteria flowers along with their perfume, their hardiness and dense foliage makes them a desirable garden and shade plant for pergolas and wisteria arbours. However, Wisteria are large, tough plants so it’s important to have an appropriate structure to give your wisteria support. Not only can it be invasive, but if Wisteria twines around a structure it can literally break and pull posts and garden arches out of the ground. Wisteria’s are fast growing and develop tree-like trunks. They can live to well over 100 years, with some in China reportedly being around 250 years old. If you are wanting to buy a small garden arch for your wisteria, you might want to reconsider either the structure or the plant. As Tricia shows in this video, they are large plants that need to be kept in check if you want them on a small arch and are best suited to large gardens. Wisteria can become invasive as suckers erupt many metres away from the parent plant, and have the potential to quick take over a garden. The following video was filmed in spring before our Wisteria bloomed. (NOTE: it was planted by the previous owners of this property). “A lot of people have been asking us for garden arches for wisterias and one of the things that I wanted to point out is that a garden arch is probably not the most appropriate support for a wisteria. As you can see behind me, this wisteria is about 15 or 20 years old and if that was growing over an arch that’s about 1.2m wide … that’s about this wide … then it would certainly be struggling to support it. For example if you look at the trunk on this, it was actually growing around this permapine post, which has now been bent and broken by the plant. If that was on an iron or a metal garden arch, it would certainly have bent that and destroyed it by now. The support for this whole pergola is actually this wisteria at this point in time. The other thing I’d like to show you is that they throw out suckers. This is probably one of the shorter suckers which is around 10 or 15 metres long, and there’s not just one, there are many. If you plant a wisteria, make sure you give it adequate support … Choose a large, open arbour or pergola with strong, weight supporting,open bars – not mesh. … it will grow big, it will be rampant, it will need maintenance. If you’re contemplating planting a wisteria and need advice on an appropriate wisteria arbour or support then contact us today. 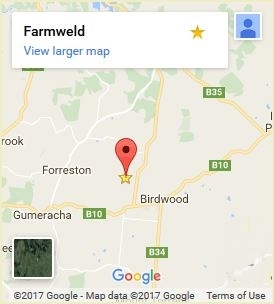 (Please note that if you are not in Adelaide or South Australia, we may not be able to freight large structures interstate).